How does one successfully achive beautiful and natural looking hair color with truly delightful results!. Only a thorough knowledge of available hair color techniques, product types and maintenance will help you make confident decisions about how to choose the right product or service at hair salon. Semi-Permanent hair color product contains a low percentage of peroxide (or none), and no ammonia. These type of color treatments normally last for 6-8 weeks (fade after 6 to 12 washes). This is one of the most popular and least damaging color types for hair. You can only use this type of product to darken your hair (no lift). Depending on your base color you might be able to go a little lighter but not much. Semi-permanent hair color can not fully cover gray hair and gray coverage is very low but can be used to blends in with gray. Depending on the manufacture and shade, you can expect 30% to 80% gray coverage. You need to maintain the root regulary. Using a Semi-Permanent hair dye is a good way of testing a color without long term commitment or risk of damaging the condition of your hair. A good choice for those with chemical processed hair (relaxers, perms, ...). You can also use it to refresh your previous color or correct a fading permanent hair color. These colors getting better and better and new generations produced by manufactures contains longer lasting effects and are more practical and economical to use. This type of hair color product containing a much higher percentage of peroxide (normally 6% developer is used), no ammonia but it can go deeper into hair shaft than semi-permanent and can last longer. Roots need to be touched up every 4 to 6 weeks (Fade after about 24 washes). Gray coverage is higher. These type of color treatments normally last more than 10 weeks. You can only use this type of hair dye to darken your hair (no lift). Not strong enough to remove color pigments but depending on your base color you might be able to go a little lighter. This type of hair color product containing peroxide and in some brands even ammonia. Can make hair darker or a few shades lighter. Permanent hair color treatment lasts until new hair grows out. Like Demi-Permanent, roots need to be touched up every 4 to 6 weeks. Cover gray completely. Disadvantage of permanent hair color is growth of new hair. It is a different shade and will leave a line. Permanent hair colors can also dry out your hair and cause damage, unless you use good moisturizing products. This type of hair dye will remove your previous hair color pigments and deposit new pigments deep into hair shaft in one step. Process is harsh and damaging to hair and must be handled with care, so if this is your first time coloring your hair then stay away from this type of coloring or go to a salon professional. Salon professionals can regulate amount of peroxide (10%, 12% or 20% developers) to acheive optimum resulting shade with less damage possible. Lately, so many new root concealing products have come on the market that it's hard to know what to buy. So let's take a look at the various types available from permanent brush-ons to temporary markers, powders and sprays. How to Repair a Bad Color Job? If you color or dye your own hair at home then there are some home products you can use to repair the damage, fix or remove the color but it isn't easy. The problem is that if you used a home hair color kit to obtain a lighter color, your hair has been "bleached" and colored in a single process. So the color needs to be added back in a process called "filling" before using the final color formula. Whatever you do, don't simply buy a box of your original color and try to cover over a bad dye job... it won't work. Fixing hair color gone wrong is a multi-stage process so a trip to the salon may be in order. Professionally applied color processing can have an amazing effect on your hair and your appearance. If you like the idea of changing your color frequently or want to give hair dimension and movement, ask your colorist for special effects hair color or a few highlights or lowlights, in just one to two shades lighter or darker than your base color. Should You go for Balayage or Normal Coloring Technique? Not everyone aware of this color technique. Balayage is a French word that alludes to the process of painting or applying dye onto hair freehand and without using the conventional cap or foiling techniques. There are advantages that you might like to consider before opting for regular techniques. You can read more about it here. Coloring select strands in the hair with a permanent hair color, lightener (bleach) or toner. 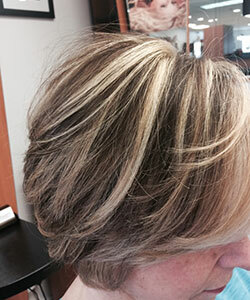 Highlights contrast natural color and are created with foils or a cap. With Highlighting, strands of hair dyed with lighter shade than your natural color. Root maintenance every 2-3 months. Highlights add a new dimension to hair color. Adding darker strands with permanent or demi-permanent hair color to the hair to "tone down" a too light look. Also created with foils, caps, or combs. The effect complements the natural color and add depth to hair. Root maintenance every 2-3 months. One trick to create an illusion of thicker hair for fine hair is to apply darker hair color to some of your underneath layers (normally one or two shades darker than your hair color ). This color technique will make your hair look thicker and will add additional depth to your hair. Applying a hair color (Semi-Permanent) after hair has been decolorized to give it tone and dimension. Require maintenance and reapply every few weeks. Removing natural hair color with a lightener or bleach. I strongly recommend that you don't bleach your hair at home and leave your highlighting to professionals. You can overprocess and damage your hair or get a bad shade of orange color. Here you can ask questions, get answers from real people, or share your advice and insights on hair coloring. What colour product last more than 4 weeks? Will Dye Change My Natural Color Once Fades? What to do with my hair - Help? Which Colour Should I Dye My Hair? Colouring hair after a keratin treatment?